The pharmaceutical industry is on the brink of a major boom – and the University of New Brunswick’s medicinal chemistry program is ready and waiting. 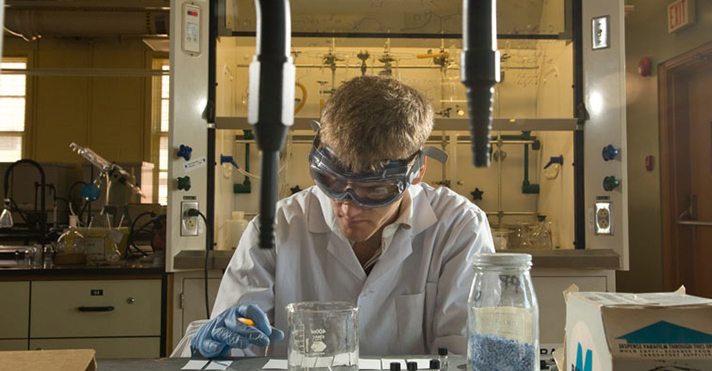 Offering one of the few medicinal chemistry programs in the country, students are preparing to work in the pharmaceutical industry. Dr. Ghislain Deslongchamps, chair of the chemistry department, believes students in the program will face endless opportunities in the future. Deslongchamps said the Canadian pharmaceutical industry is facing some challenges, but UNB’s location is nevertheless beneficial for those in the program. Summer job opportunities are common in the program. The department hires summer research students and faculty members encourage students to apply for summer jobs with pharmaceutical and biotech companies. Fourth-year medicinal chemistry student Jillian McNally found a summer position with a pharmaceutical company in Quebec. The ability to use classroom learning in a real world setting helped solidify her understanding of the topics. McNally plans to attend medical school following graduation, but with her medicinal chemistry experience she could find a career anywhere in the pharmaceutical industry. Deslongchamps said these positions give students hands-on experience while also providing an indirect indication of how the program is faring. “There’s one company in particular that has been extremely happy and impressed with students we’ve been sending them. They are well-prepared for the workplace,” he said. At UNB, the medicinal chemistry program quickly became the most popular chemistry option in the department and is now accredited by the Canadian Society for Chemistry. The program’s roots date back about 15 years, when the university first offered courses in computer-aided drug design. “The first course, Bio-Computing and Drug Design I, just took off. Students were very interested and next thing we knew, we were offering a second full-term course. At that point I knew we should have a medicinal chemistry program,” Deslongchamps said. Unique to UNB’s medicinal chemistry program is the decision to offer computer-assisted drug design courses at the undergraduate level. “Computer-assisted drug design is usually something that is taught at the graduate level. But years ago I realized that if we presented it appropriately, why couldn’t undergraduate students learn how to design drugs on a computer? Bio-computing courses were co-designed and are co-taught by a chemistry professor (Deslongchamps) and a computer science professor (Rod Cooper), so students get an integrated view of how the computational tools work. This cross-disciplinary course structure is very unique, Deslongchamps said. This type of program is one of only a few across the country, making UNB’s program very attractive to potential and current students and signalling its success to the department.